For the past few days I have been working in the house of a woman who is on vacation. We made a deal: I can work for ten days (= 90 hours = 2250 euro) in the four weeks that she is away. In ten days I cannot do everything that needs to be done, but she knows that. I have to make choices and find easy solutions. And to work real hard, which I love to do, especially if the other party is 100% okay. I hate it when people have no idea about the work that I am doing. Some people have no clue what it takes to tile a wall, to built a bookcase or to paint a house. It doesn’t matter if they overestimate my work or underestimate it; it doesn’t feel good in both cases. This woman has been doing a lot of work in her house herself, so she knows very well what I am doing. And she never hassled about the money, which is another important issue. I don’t mind working for less, if somebody really has no money and there really needs to be done something. But if people have the money, I want to get paid 25 euro per hour. And most people that I work for make no problem at all about money. That was very different when I worked as a letterer/logo designer; I remember many times that people were trying to make me do things for less or even for free. The woman who is on vacation has a small collection of art books. I take one with me every day. (And bring it back the next day, of course.) 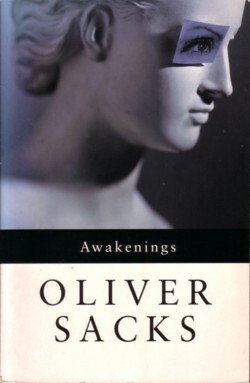 But tonight I took from her shelves the second book that Oliver Sacks wrote: ”Awakenings” . I have read the book before, but my copy is gone, and this is a new edition (1990) with extra pages. If you have only seen the movie, which I think was very well done: the real story is more extreme. Certain scenes where left out of the movie, because they were afraid people wouldn’t believe them. There were for example two men, who had been in “sleep” for 25 years, not moving or saying anything at all, just sitting and staring all day. One day they were caught fighting and screaming; the fight lasted only a few minutes; after that they picked up their “normal” behaviour again. Hm, if you don’t know what ”Awakenings” is about, this story makes no sense at all. In the introduction Oliver Sacks uses the sleeping sickness as a metaphor for our everyday state of mind, from which we can also awake under special circumstances. It is hard to read this book without thinking about this metaphor at least once per page. I first heard about this metaphor, which is not really a metaphor but an accurate description, from Colin Wilson, who wrote about Gurdjieff. Gurdjieff’s ideas, about the fact that we are asleep and that we can wake up by Self-remembering, made a deep impression on me. And they still do. I cannot hear any pop song about sleep or waking up and not think of the ideas of Gurdjieff. I wonder how many other people listen to a song like this and think of Self, Self-remembering, waking up, etcetera. Imagine that Roscoe Shelton is not singing about a woman, but about his Soul, his Self or whatever you call it.